Make your own Snowman Ornaments. It is getting closer to that time of the year when we start thinking about Christmas decorating. It’s probably too soon for most of us to be thinking of decorating, but definitely not for crafters who have to actually make their ornaments instead of purchasing them. 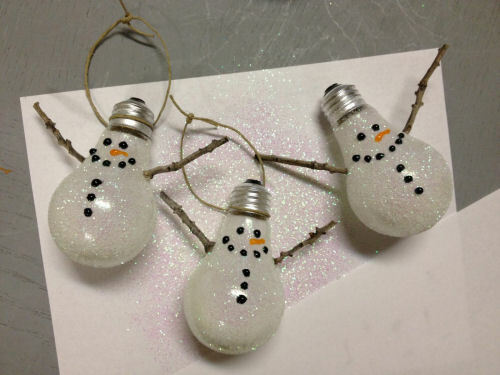 This sweet snowman ornament is easy to do and makes use of some common household items: a light bulb, some craft glitter, a couple of twigs, some glue, and a bit of string. Add some puffy decorating paint and you will have a sweet ornament. For more directions and step by step photos for the project, please visit Kelsy Bang.